Is your current trimmer dying due to low charge quite often? Are you looking for a trimmer that comes with great battery life? 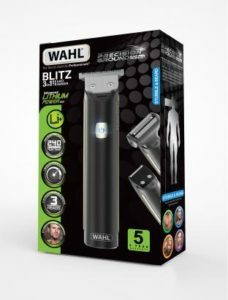 If yes, the Lithium Blitz Beard Trimmer from one of the oldest and most reputed names in the grooming world, Wahl, is the right choice for you. Wahl has been making products since 1919, and you can be assured that this trimmer comes with battery power that just cannot be compared with the normal rechargeable batteries that you find in most of the other trimmers in the market. Interested to know more? Read our Wahl beard and stubble review to get introduced to some of the features and settings of this trimmer. 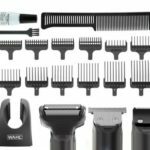 Comes with 12 interchangeable guide combs with length settings ranging from 0.5mm to 25mm, giving you the flexibility to choose the exact length that you want. This is one of the longer guide lengths out there to help you keep your long beard trimmed. Blades powered with high precision grinding technology so that that they are nicely ground to give a high quality of shave. The finer the teeth, the finer the quality. Removing the trimmer head seems to be cumbersome, and you will need to read the instructions to make sure you are doing it correctly. This trimmer was first available in July 2015 and has received mixed reviews. It currently has 3.9 out of 5 stars with 75% being four stars or higher, but over 15% are one star. The price point of this Wahl trimmer makes it quite an investment for the mixed reviews out there. There are quite a few other trimmers on the market at a lower price point which might suit you better. The one definite upside is the length of the trimmer guide up to 25 mm for maintaining a longer beard. Look through some of our other beard trimmer reviews if you don’t think this will meet your expectations like the Best Beard Trimmer Reviews.